I stand with fast food workers! Next time you hear someone decry that those on public assistance should, “Go flip burgers at McDonalds,” remind them that the average fast food worker makes $11,000 a year. I know of nowhere in the United States where you can live on $11,000 a year. The campaign — backed by community and civil rights groups, religious leaders and a labor union — has engaged 40 full-time organizers in recent months to enlist workers at McDonald’s, Wendy’s,Domino’s, Taco Bell and other fast-food restaurants across the city. I love it when friends go to Europe and bring me back treats. 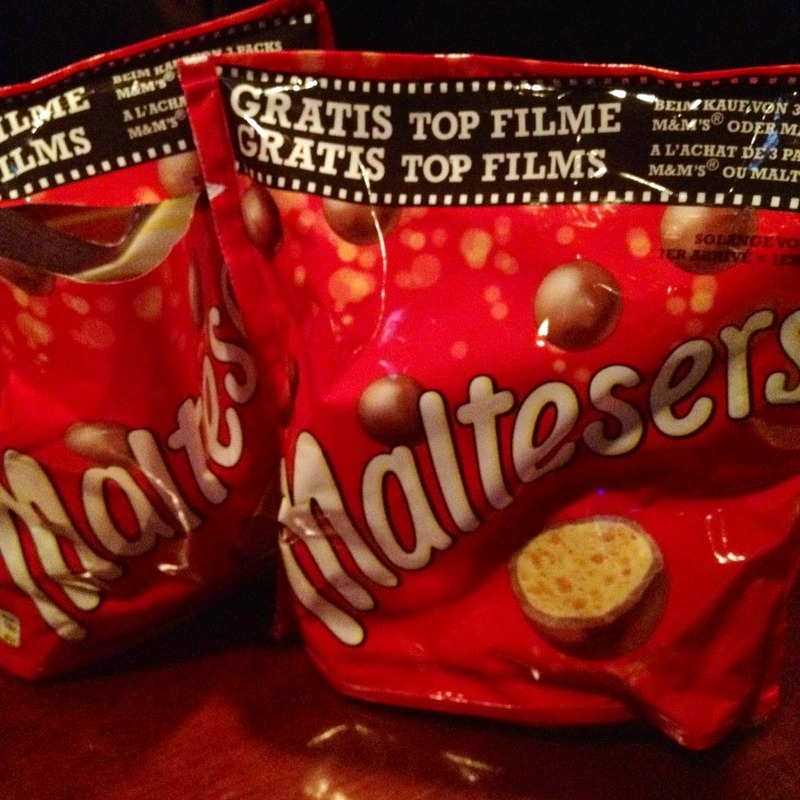 If you’ve never had Maltesers you don’t know what you’re missing. They’re chocolate covered malt balls, but they’re nothing like their American cousin Whoppers. The chocolate is real with none of that sickly sweet artificial after taste and the texture inside is always crunchy; never hollow or fake tasting. I’m thinking of making Maltesers Blondies. How does that sound? I’m not a huge chocolate person. No, that doesn’t mean that I hate chocolate. I don’t mind chocolate and I think it can make a nice accompaniment to things, I just don’t get what all the hype is about. Since there were a few chocoholics at our Thanksgiving table though, I thought it only right to make a chocolate dessert. 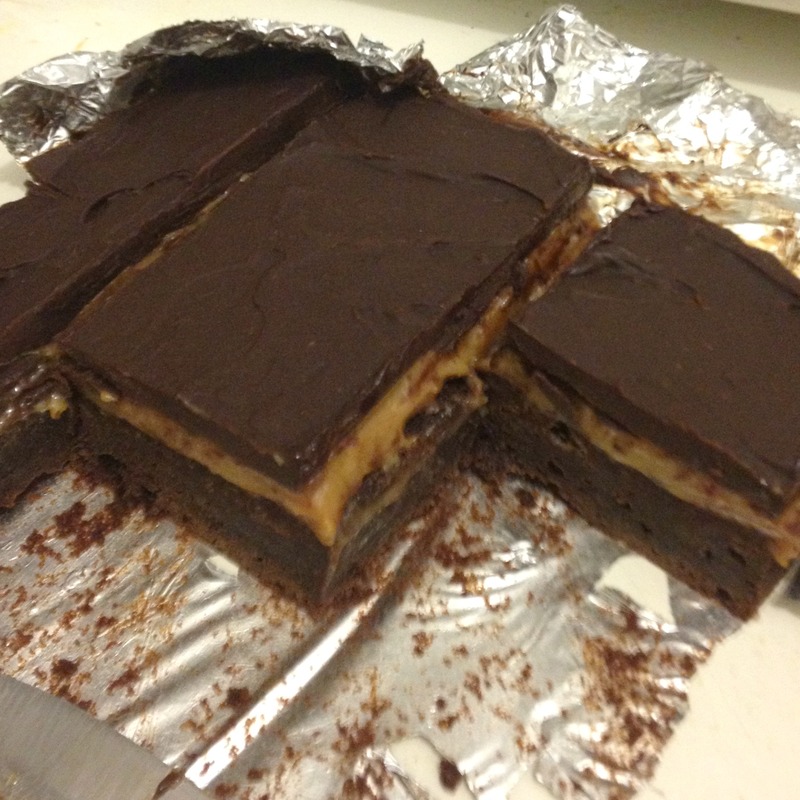 I decided on dulce de leche brownie bars. 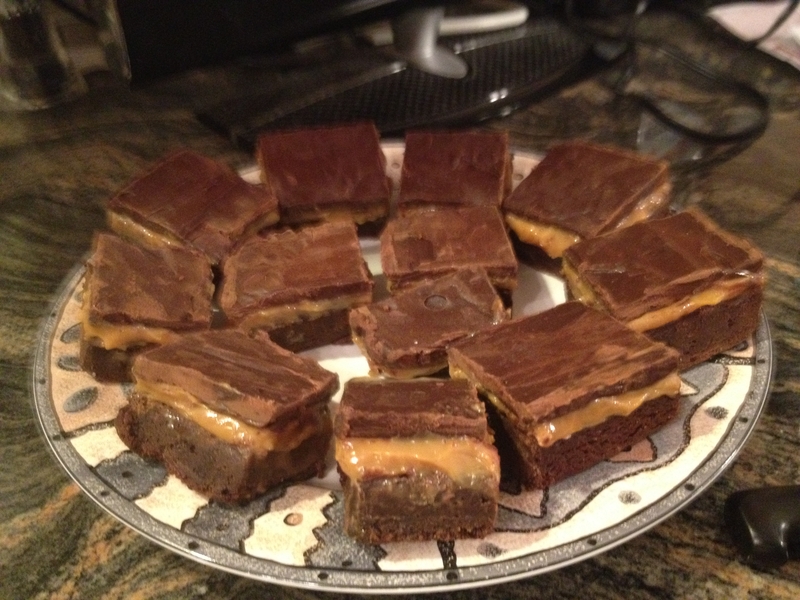 They were a huge hit with everyone at the table and I will definitely be making these again. Though they take some time they’re actually really easy to make and they can be made several days ahead. The hardest part of the whole process is cutting them in to squares. This recipe is adapted from the Grasshopper Squares recipe from Gourmet magazine (which I also plan on making at some point because I do love mint with chocolate). Enjoy! Preheat oven to 375°F. Lightly butter an 8×8, then line completely with foil leaving a 2 inch overhang on all sides. Butter foil. 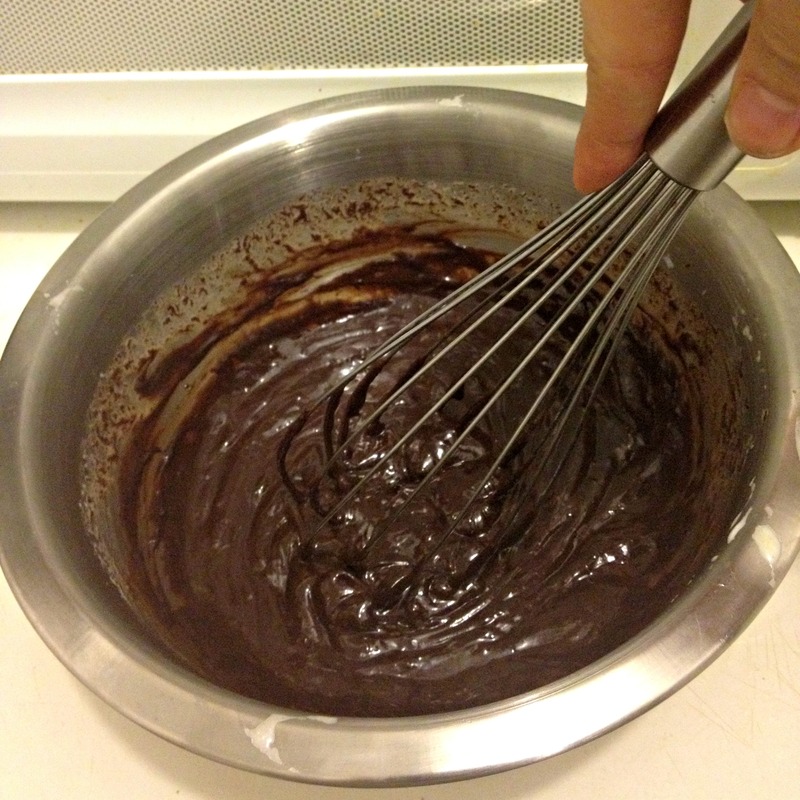 Melt butter and chocolate with brown sugar in a small saucepan over medium heat, stirring occasionally, until smooth. Remove from heat. 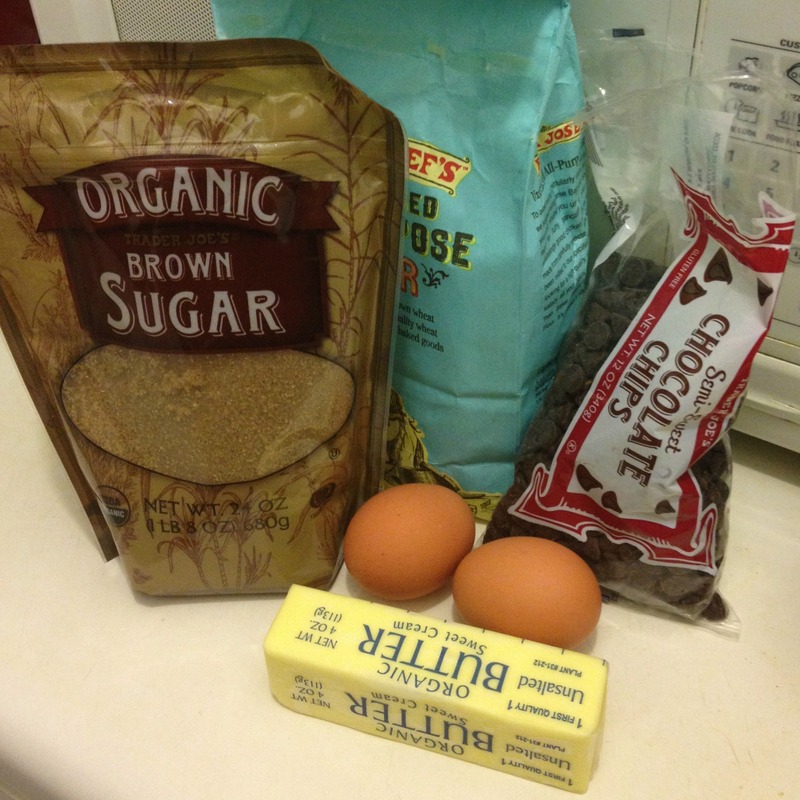 Whisk eggs and vanilla in to chocolate mixture until combined. Then whisk in dry ingredients until just combined. Pour batter in to foil lined pan as evenly as possible and bake 15-20 minutes until a toothpick inserted in the center comes out with moist crumbs. Allow to cool completely. Store in refrigerator. Peel the label off of your can (only so it doesn’t make a mess in your pot). Place sealed can in a deep pot and cover with water. Bring to a boil and allow to boil for 2 hours making sure the water never dips below the can and adding more boiling water when necessary. It is very important that the water not dip below the can because the pressure of this can cause the can to explode, which is not only messy, but dangerous. I suggest keeping a kettle of simmering water next to the pot to add when needed and check every once in awhile. Remember that the deeper your pot the better. After 2 hours, gently dump the water and can in the sink (I usually do this through a colander to give the can a softer landing). Allow to cool until you are able to handle the can, but contents is still warm, which will take a few hours. 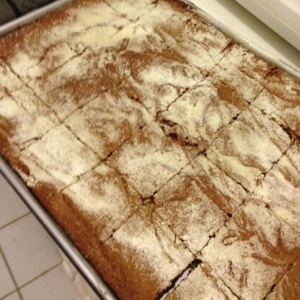 Pour warm dulce de leche over chilled brownies and smooth with an offset spatula. Chill completely in refrigerator. 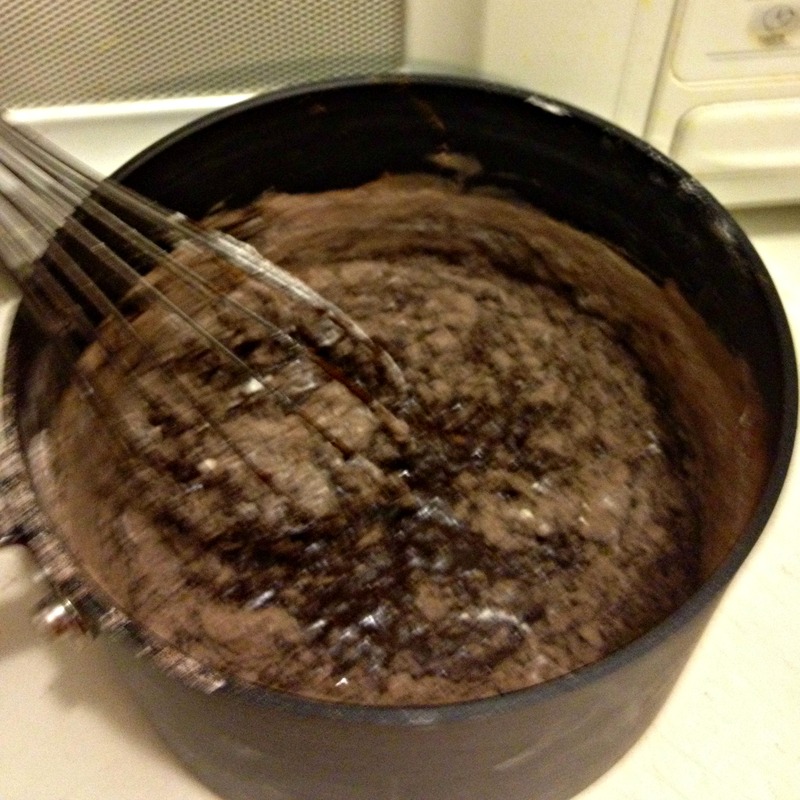 Put chocolate chips in mixing bowl and set aside. In small saucepan bring cream to a simmer. Pour cream over chips and allow to stand one minute, then whisk until smooth. 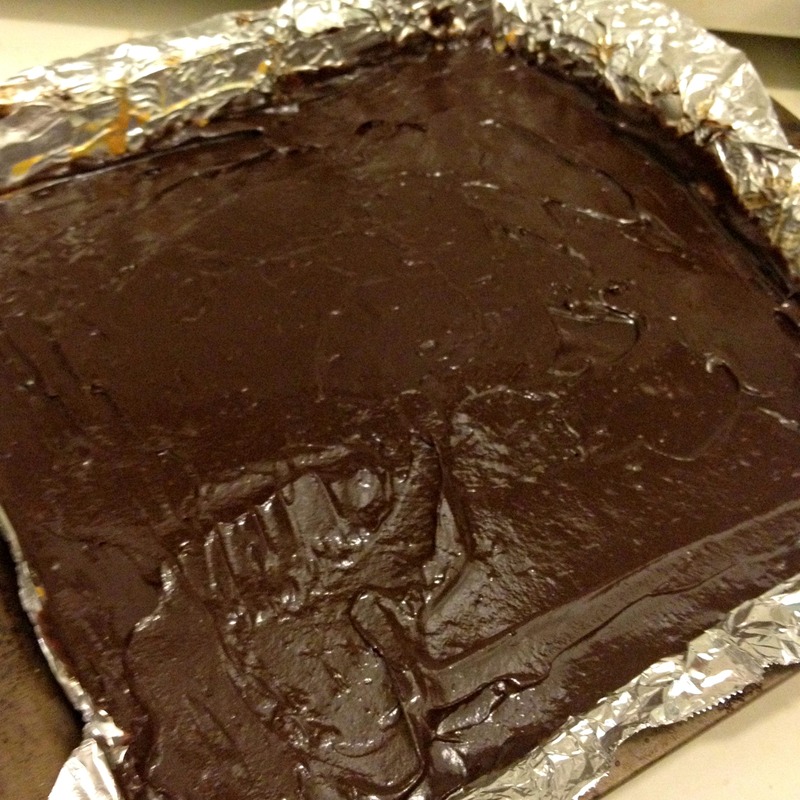 Allow to cool slightly until ganache is still warm, but manageable. 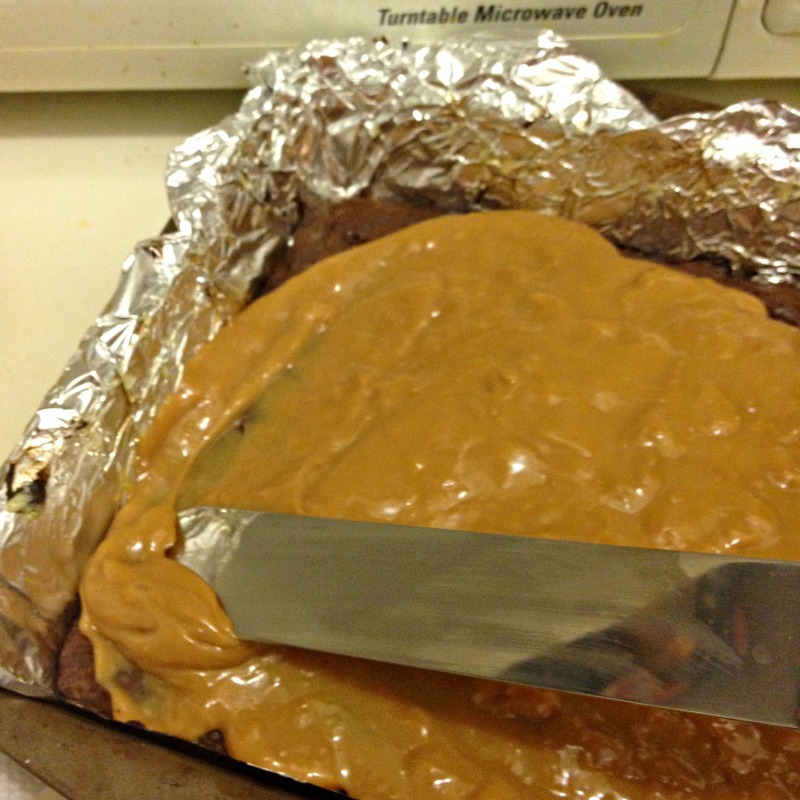 Pour over completely chilled dulce de leche layer and smooth with offset spatula. 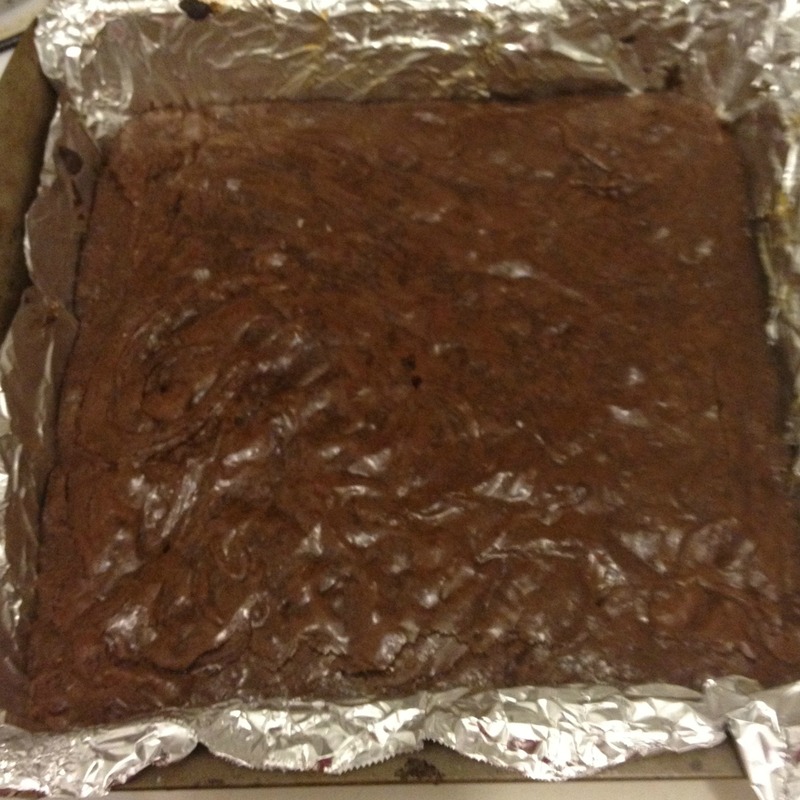 Once brownies have completely cooled remove them from pan by picking up the the foil overhang. Peel the foil from the brownies. Run a long sharp knife under hot water and wipe dry. 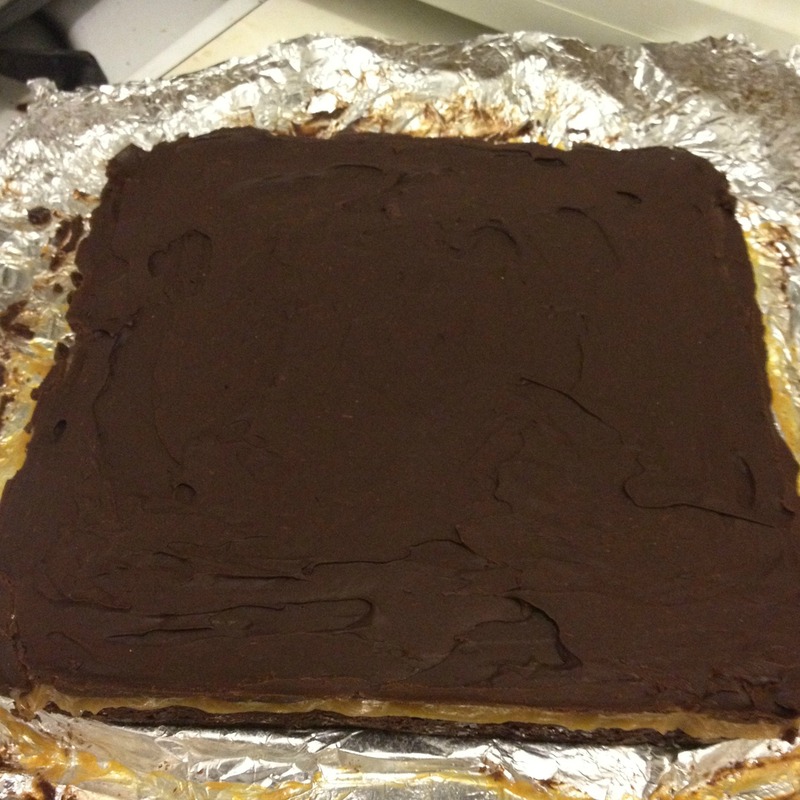 Cut brownies in to squares continuing to heat and dry the blade as necessary. This will take some serious upper body strength. Remove from refrigerator a few minutes before serving. Brownie bars can be stored layered between sheet of wax paper in an airtight container in the refrigerator for up to two weeks. We we we we gonna have a good time. Today I’m grateful for this holiday. Thanksgiving is an easy holiday to love. It’s the one day a year when it’s totally acceptable to fill your plate with carbs, when the correct answer to the question, “mashed potatoes or sweet?” is “Both!” How do you not love that!? I also love that Thanksgiving is the most American of holidays. I remember back in elementary school learning about both the “melting pot” view of America vs. the “tossed salad” view. The melting pot view teaches that when immigrants come to this country they all blend together in to one to become Americans. The tossed salad view teaches that when immigrants come to this country they retain their own unique flavor which just makes the proverbial salad that much more delicious, each individual ingredient tastes great on it’s own, but when taken together it really turns in to something extra special. I’ve always been in the tossed salad camp and Thanksgiving is one of our best examples of the tossed salad view in action. As Americans most of us have all of the same staples on our Thanksgiving tables; a turkey, mashed potatoes, stuffing, etc. Depending on the culture you come from though, there are often some untraditional additions. I have Italian friends who serve a pasta dish, Indian friends who have a curry on their table, German friends who prepare braised red cabbage as part of their feast. America is a place where we can celebrate both our similarities and our differences and Thanksgiving gives us a great opportunity to do that. A couple of weeks ago when of my favorite neighborhood bars, George Keelys, hosted a fundraiser for hurricane relief. As part of the fundraiser they sold raffle tickets and as prizes you’d be able to select one out of a selection of some really rare specialty craft beers. For a craft beer lover like me those were magic words and when I won I was psyched. The choices were overwhelming, but I’d been chatting with a guy who works in the beer industry and he helped me make my pick. 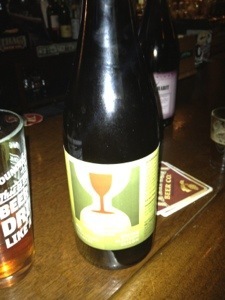 According to the guy who was helping me Hill Farmstead Brewerys Vera Mae was brewed only once and never shipped out of Vermont (someone had brought it themselves and donated it for the fundraiser) so I likely had one of the only bottles in New York! I’m waiting until next weekend, when I have some beer living friends visiting, to try it. I’m so excited and of course I’ll report back. Today I’m thankful for all of the amazing friends that blogging had brought in to my life. I used to have a personal blog which is how I met most of these amazing people, but now so many of them have become friends beyond blogging. My relationships with my blog friends formed largely in the same way pen pals did way back when. We learned about each other largely through the written word, but we bared our souls and let ourselves be vulnerable and opened ourselves up to this amazing community of people. I am beyond lucky to have a great group of close friends and these days I count many of the friends I’ve made through blogging among them. They’ve laughed with me and cried with me and are steadfastly in my corner always cheering me on. They say that you can meet “the one” anywhere. I believe that and I also believe it goes for friendship too. If you open yourself up you can meet some extraordinary people and form lasting bonds in unexpected places. So bloggy buddies, today I’m thankful for YOU! Here’s what I tell people about my food, I guarantee it’s gonna taste good, but it might not looks so good. Unlike most other food bloggers out there, I have zero talent for anything crafty. I am not at all domestic, I’m just a great cook. So, while I’ll mix the ingredients in a way that will make your taste buds happy, but the garnishes will be falling off the top of the cake will be cut in to servings that look more like puzzle pieces. Text messages certainly shouldn’t replace real conversation, but I love that text can keep you engaged with friends. As my friends and I have gotten older, we’ve gotten busier and it’s become harder to have long phone chats on a regular basis and most of my close friends don’t live in the same city as me so we also don’t see each other that often. Text messaging allows us to always keep in quick touch. Sometimes it’s a quick, “Was just thinking about you. I miss you,” or a “OMG I just saw [insert celebrity] at Starbucks” or a funny picture we know will crack the other one up. Text messaging (actually iMessage) also allows me to keep in touch with friends abroad. iMessaging is free whereas international calls can be obscenely expensive. Text messaging is certainly not perfect, but I’m very thankful that it’s a quick and easy way for me to always be in touch with people I love even when they’re not nearby. 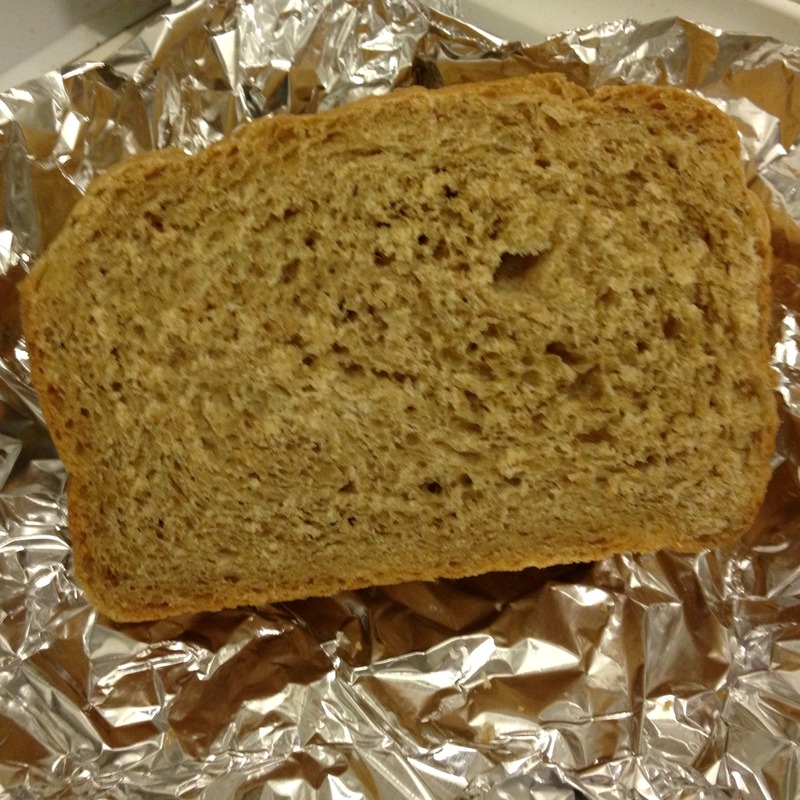 I came to work on Friday to find a hunk of homemade bread my coworker Julie had baked waiting for me. It was dee-licous! Do you have any coworkers who are that cool? Today I am thankful that I’m in a position to help others. The words struck me. Those of us who lived in areas largely unaffected by the storm had a sort of collective survivors guilt, but that comment helped me to re frame my thinking. Perhaps some of us in New York had gotten off so easy so that we would have the capacity to help others. This is not just related to the aftermath of Hurricane Sandy though because I am fortunate to have the ability to help others all year round. I am certainly not in much a financial position to help anyone (I can barely help myself financially), but I’m blessed to have my health, an education, a safe place to live, access to clean water and food when so many others don’t. Even if I can’t contribute much monetarily, I have my voice, I have my hands and I have my time and I am very lucky for that.